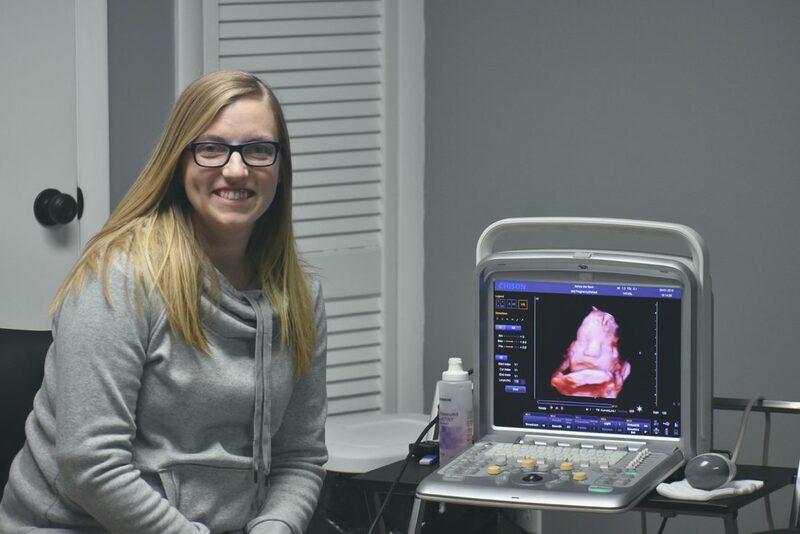 SUGAR GROVE, Pa. — Alex McCandless, a ultrasound technologist at UPMC Chautauqua, began a side-ultrasound business, Before The Stork, in 2016, but only recently did she officially open her office for business. McCandless’ business previously offered exclusively home visits for ultrasound related services. Now at a reduced price, individuals seeking McCandless’ services can visit her home office at 2 1/2 Main St., Sugar Grove, Pa.
Before The Stork offers pregnancy confirmation, gender reveals, 3-D and 4-D ultrasounds and blood-drawn gender reveals at 9 weeks. Also, McCandless provides heartbeat bears that mimic a baby’s actual heartbeat through a recording and is placed inside a stuffed animal. For gender reveals, Before The Stork can provide confetti cannons and smoke bombs. McCandless said her business doesn’t feel like work.When she leaves UPMC Chautauqua as ultrasound technologist, she heads to her side business of the same industry. At her job at the hospital, she shifted from baby ultrasounds to cardiology ultrasounds. For her, the side business was a way to get back to what she loves. “I knew I wanted to be in the medical field and I love babies so much,” said McCandless, who is currently pregnant herself. McCandless said much of her business funnels from the other side of the stateline in New York, but specifically drawing blood for gender reveals is banned in the state. McCandless decided to open up shop in Sugar Grove, less than a 20 minute drive from Jamestown instead to freely offer all of her services. Being open since 2016 has already made the ultrasound business profitable, McCandless said. Typically, pregnant individuals are not sent for a third trimester ultrasound to see their babies another time before birth, but at Before The Stork they can. “It’s just more for anxious moms who want to see their baby again,” McCandless said. Often, McCandless is hired for baby showers where she brings her equipment that includes the ultrasound machine, a table and an additional TV for viewing. She said a busy week would consist of five to 10 home visits per week. But with her pregnancy, which she revealed to herself to be a boy, will possibly keep her at the office more and limit the amount she can make home visits for clients. “After I have my baby, I don’t think I’ll be traveling as much so it will be nice to have a spot for people to come here,” McCandless said. With the home office, she believes she will find even more success. Having both options of offering a location to pregnant individuals to visit and also making home visits, McCandless believes her services are unique. Another bonus at Before The Stork is the comfortability it offers. “It’s just a fun way to see your baby,” she said. Various packages can be found on the website beforethestorkultrasound.com or on facebook. McCandless can be reached at beforethestorkultrasound@gmail.com.